Fee: $22/$18 members - includes an autographed copy of The Rooms Are Filled, refreshments and admission to the sculpture garden -- come early for a stroll around the grounds! Register online now. Margy Stratton, founder and executive producer of Milwaukee Reads continues year three of her series featuring writers of particular interest to women. We are joined this year by series sponsor Bronze Optical and treats sponsor MKELocalicious. Lynden Sculpture Garden's Women's Speaker Series, Bronze Optical, and Boswell books welcome Jessica Null Vealitzek author of The Rooms Are Filled to the Lynden Sculpture Garden, Wednesday, May 28, 7-9 pm. In the mid-1980s, AIDS hysteria and homophobia were rampant. Fear and ignorance led to increased discrimination, especially in the classroom. 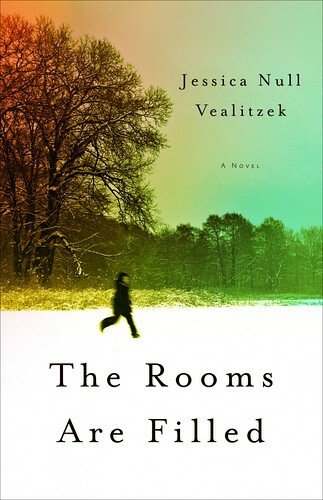 Set in 1983, The Rooms Are Filled, by Jessica Null Vealitzek, is the beautifully heart-wrenching story of two castaways brought together by vastly different circumstances. At nine years old, Michael Nygaard is transplanted from his Minnesota farm, and the sacred wolf-filled wilderness that surround him, to suburban Chicago (Ackerman, Illinois) after his father dies abruptly. Simultaneously, Julia Parnell escapes to Ackerman in hopes of beginning her life anew after a failed attempt to live openly with her lifelong girlfriend, Rose. In his new town, Michael doesn’t fit with the characters that surround him: the wild girl across the street, Tina, nurtures their friendship and then undermines it; Tina’s alcoholic father rockets between affability and rage; and the relentless bullies at school taunt him. He finds temporary refuge with his proper, young—closeted—teacher, Miss Parnell. When Julia’s secret is exposed, she faces a choice: accept herself or deny her true nature. Michael must also choose whether to simply endure or fight back. Coming of age will take bravery from these two lost souls and if they cannot find the strength to change, neither will have the life they deserve and desire. Jessica Null Vealitzek was born and raised near Chicago, where she still lives with her husband and two children. She majored in American Studies at Lake Forest College, then earned her M.F.A. at Roosevelt University while waitressing and reporting for a suburban newspaper. A Midwesterner through and through, she believes in the power of the quiet stories of everyday people. A former communications director for a gubernatorial candidate and an exhibit writer, Vealitzek writes for Rebellious Magazine, Great New Books and PDXX Collective. The Rooms Are Filled (She Writes Press) is her first novel.